The best ever Pineapple Jam Tarts with a crumbly sandy crust and golden homemade pineapple jam. Totally irresistible and a must-try for special occasions. It’s here! After all these years, I finally got round to making these much requested Pineapple Jam Tarts. It is a favorite Chinese New Year “cookie” for many in Malaysia and Singapore and for good reason. Firstly, you can’t go wrong when the main ingredient is ong lai (pineapple) which literally means “Prosperity come!”. Secondly, how can one resist such a pretty and tasty cookie? It is a fact that some avoid these mini tarts because they can’t just stop at one. Case in point, in just a few days my 42 tarts are almost all gone and there are only the 4 of us. These amazingly tasty tarts do take time to prepare but I assure you they are well worth the effort. In Malaysia and Singapore, they are one of the most sort after and expensive Chinese New Year cookies one can buy. Homemade ones from the cottage industry are the best but they can be pricey because it is time consuming to make each individual tart. Even so, they are in high demand and those who offer to make them will only accept a certain amount of orders. 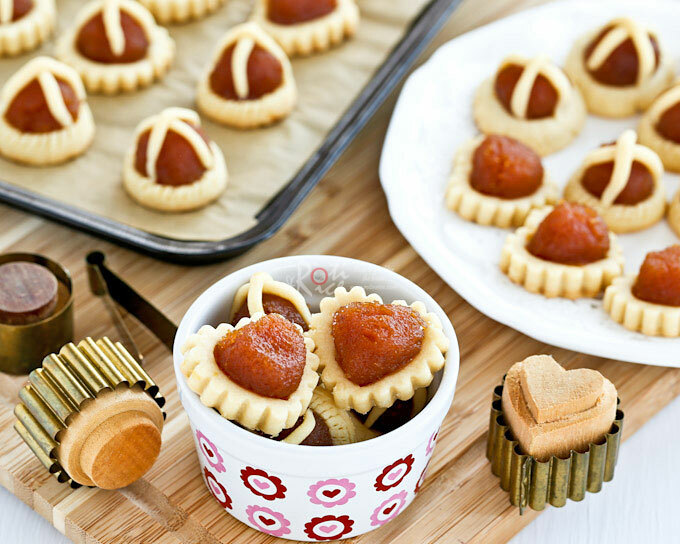 Unlike other cookies, Pineapple Jam Tarts are best consumed within a week. 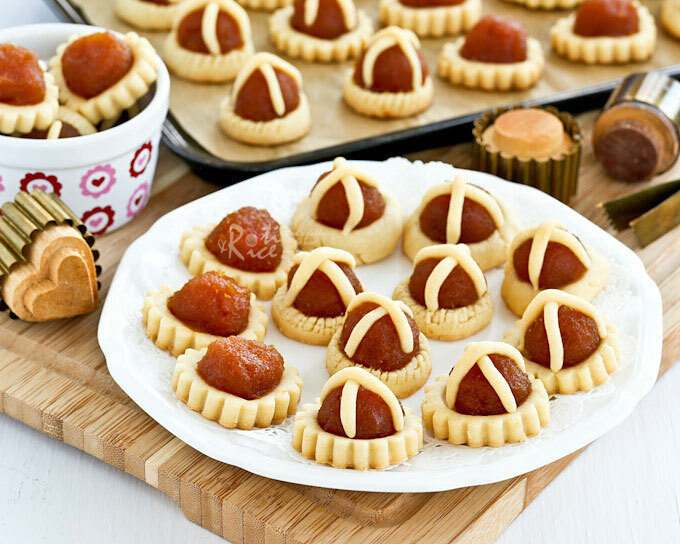 Traditionally, Pineapple Jam Tarts are open-faced tarts with bits of criss-crossed dough on the top to facilitate stacking. As time went by, people became creative and made them into pineapple shaped cookies with the dough encasing the pineapple jam. 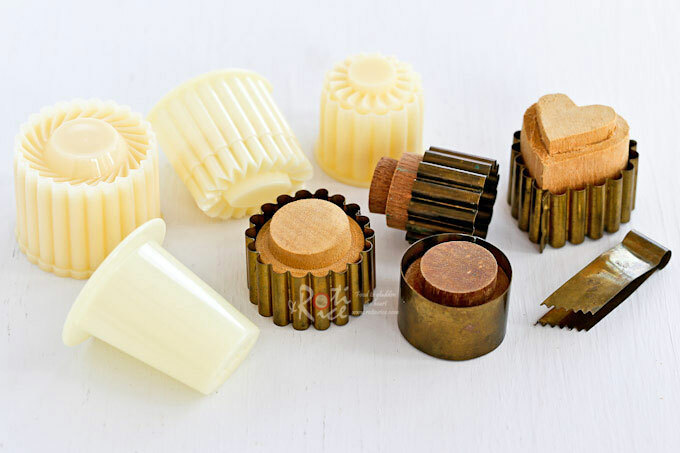 Other variations include the nastar cookie where the dough is extruded through a metal or plastic tool to form a jagged piece of dough to be wrapped around a ball of jam. My personal favorite is the smooth round mold where the perimeter of the cookie needs to be crimped with a crimping tool. The crimping is done in such a way as to press the dough into the jam so that it hugs the jam. That was how I learnt to make it from my aunts way back in my early teens. We used to make hundreds of these mini tarts with each person doing a specific task. Now, back to this recipe. From my experience in making these Shortbread Stamped Cookies, I have come to realized that adding a little rice flour to the dough is beneficial. It gives the cookies a crumbly, sandy, melt-in-the-mouth texture which is really the aim here. I have to say I am very happy with the texture of the crust and the guys concur. 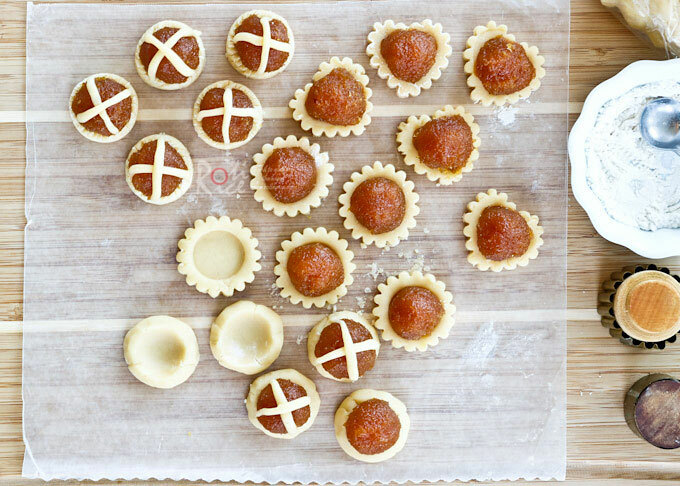 Also, like shortbread cookies, our family never use an egg wash on these mini tarts. They should be pale after baking with a light brown bottom. January and February are very cold months in Minnesota. The ambient temperature in the house is only about 65˚F (18˚C). Butter at room temperature is spreadable but not soft and so the dough may look a little stiff in the video. If you live in a place with warmer climate, the dough may be slightly softer to the touch. Please add a little more flour if it is too moist. Prepackaged pineapple jam can be found at specialty bakery supply stores in Malaysia and Singapore. To make your own, please check out my Homemade Pineapple Jam recipe. Roll pineapple jam into ¾ inch balls. You should get about 42 balls of pineapple jam. Set aside. Prepare your choice of pineapple jam tart mold/cookie cutter. Line two baking trays with parchment paper. Sift all-purpose flour, rice flour, and powdered sugar into a medium size bowl. Set aside. In a large bowl, cream butter until light and fluffy. Add egg yolks and vanilla extract and continue to beat until combined. Add flour mixture and mix with a spatula until crumbly. Gently knead to form a soft dough. Wrap in plastic and chill in the refrigerator for 15 minutes. Place a portion of dough in between two large sheets of parchment paper. Roll out dough to about ¼ inch thick. Dust mold/cookie cutter with flour and press onto dough. Push the wooden or plastic stamp to create an indentation. Lift mold/cookie cutter and release stamped dough onto work surface. Place a ball of dough in the indentation. Decorate with tiny strips of dough and crimp perimeter of cookie with crimping tool if desired. Baked in a 350˚F (180˚C) oven for 15 minutes or until the bottom of each mini tart/cookies is lightly brown. If you do not have a jam tart mold/cookie cutter, make "thumbprint" cookies instead. 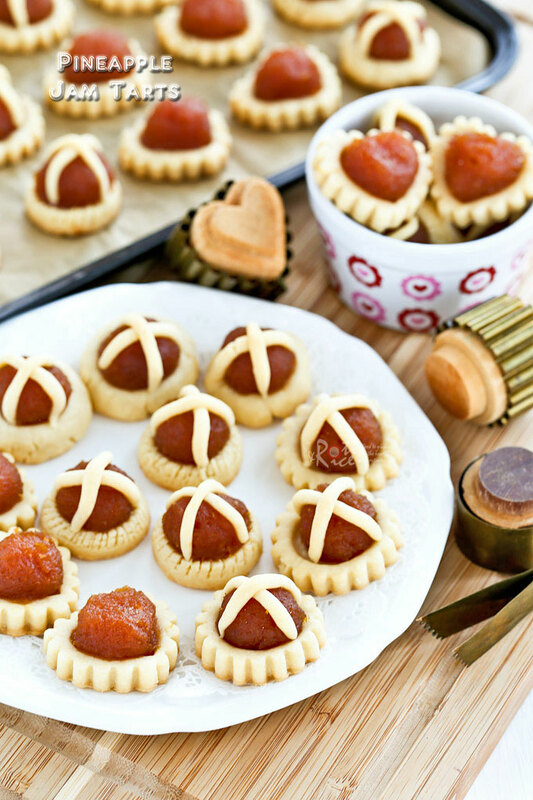 These Pineapple Jam Tarts are great for tea time and should be made year round. I highly recommend that you make some today and surprise your sweetie and loved ones on Valentine’s Day. I know they’ll thank you for it. My favorite festive cookie. Made these today. I did not have the appropriate cookie cutter so I improvised. Turned out good. Thanks for your recipe. Hello, thank you for sharing the recipe!!! I love your cookie cutters with the wood inside. Are they custom made? When you push the cookie out, is there something that prevents the wooden part from coming out of the metal part? Those are the traditional pineapple jam tart cookie cutters I purchased a long time ago in Malaysia. Today, they are mostly made of plastic. Thank you so very much for sharing this recipe and video. I know this is probably a silly question – but how long do these tarts last? 😂 I would love to make them as gifts for loved ones. Thanks in advance, and God bless. You are welcome. These tarts should last between one to two weeks. God bless you too!